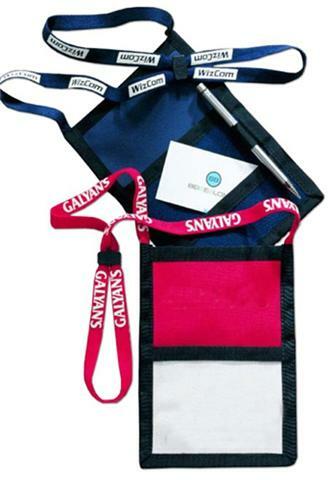 Zipper Badge Holder as trade show giveaways. Adjustable breakaway neck cord, this badge holder can fold away nicely and different lanyards used for different events. 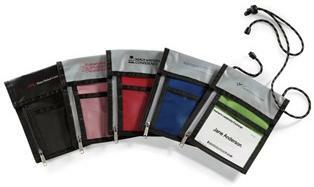 Front pocket for the display of conference badge pass and storage of business cards with zippered pocket. Back pocket for business cards/notebook/camera/phone as required…. Pen loop included and pen optional. Page markers optional to help clients mark pages of catalogues they collect. ODM can customise the pockets, colours, shape and internal components to match budget and requirements of clients. You may imprint your logo on this (and if intended for 1 use only maybe your booth number) and have people walk the trade show advertising for you. However, using these without too much overt logo and branding will give the product a higher perceived value and we recommend that mainly the lanyard should have more visible branding. ODM usually give away our Pen Fan, Lost Key or other gift with no branding on them. Since we own the moulds and the designs are unique we prefer to give customers a gift without our logos on them. What other trade show giveaways have worked for you in the past?